San Jose Stage Company premiered a new stage adaptation by Jon Jory of “Postman Always Rings Twice”, directed by Kenneth Kelleher, as a part of their 35th anniversary season. Adapted from 1934 novel by James M. Cain that was also made into a 1946 classic film with Lana Turner and John Garfield, this is a crime thriller with some twists and turns. Since its first appearance in 1934, this story captured the minds and gained high popularity. Frank (Jonathan Rhys Williams) is not only morally bankrupt but is a hobo without a sense of purpose or ambition in life. He makes a pit stop at a rural California diner for a meal and is offered a job by Nick Papadakis (Robert Sicular), the Greek owner of the diner. Franks ends up staying and soon begins a passionate affair with Nick’s wife, Cora (Allison F. Rich). Cora swoons to Frank’s rough and tumble approach to life but is unhappy with her inconvenient husband standing in the way. The first part in the play moves rather slowly and mostly focuses on Frank and Cora plotting to remove the inconvenience out of the way. In part two the story picks up speed as the duo attempts to put into practice their questionable motives and intentions. A murder plot is hatched but gets botched, elopement is planned and then abandoned, even the confession after a crime does not turn out as intended. Apart from keeping the audience guessing, the play’s many twists and turns inevitably make one wonder (especially give the current monumental political reality), as to how much and how far can lies be stretched without consequences, and if not the law, then would fate catch up to it ultimately? The play is running at The Stage in San Jose till May 6, 2018 and tickets can be obtained at www.thestage.org . It is a story of heavily polluted New Jersey town where Melvin Ferd III (Will Springhorn Jr.) resolves to get to the bottom of the cause of pollution and is pitted against town’s greedy, power-hungry and seductive mayor Babs (Allison F. Rich) and her gang of thugs. The mayor’s for-profit corporation is the cause of town’s growing pollution but the mayor is entirely focused on growing her bottom line. When the mayor’s thugs and Melvin engage in a fight, Melvin falls into a vat of toxic waste and emerges as a heroic green monster with superior strength. Melvin’s nagging mother (also played by talented Allison F. Rich) does not the express slightest shock and instead reiterates her disappointment with her son. Her lack of shock at the sight of her son is shocking in itself and at the same time her superb acting makes it feel like a natural response of a nagging mother to a child not rising up to his talents. It is all hilarious. Melvin also reconnects with his blind love interest, Sarah (Courtney Hatcher). Sarah does not know that it is Melvin and falls hopelessly in love with who she believes is the superhero who saved her from the town’s thugs. He saved my life so there is no other. Someday he’s ganna be my big, my big french boyfriend! Superbly directed by Jonathan Rhys Williams, the play is hilariously funny and witty. Cirby Hatano’s set is eye catching wasteland with scattered drums of toxic waste. Video design by Vijay M. Rajan occasionally fills the gap in the narrative and adds fantastically funny comic touches. When the fight ensues between the hero and the thugs, blood is scattered or limbs are severed on the projected screen rather than on the set. The 80s style rock style songs are played by an onstage rock band directed by Brian Allan Hobbs. 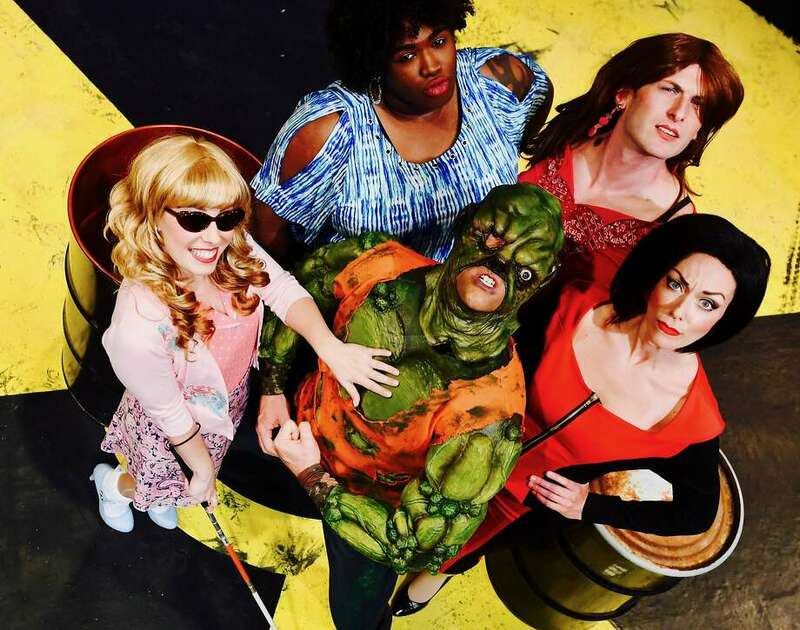 The Toxic Avenger is produced at San Jose Stage at a critical time in our history, when depressing developments on the issue of climate change makes us feel both upset and helpless. 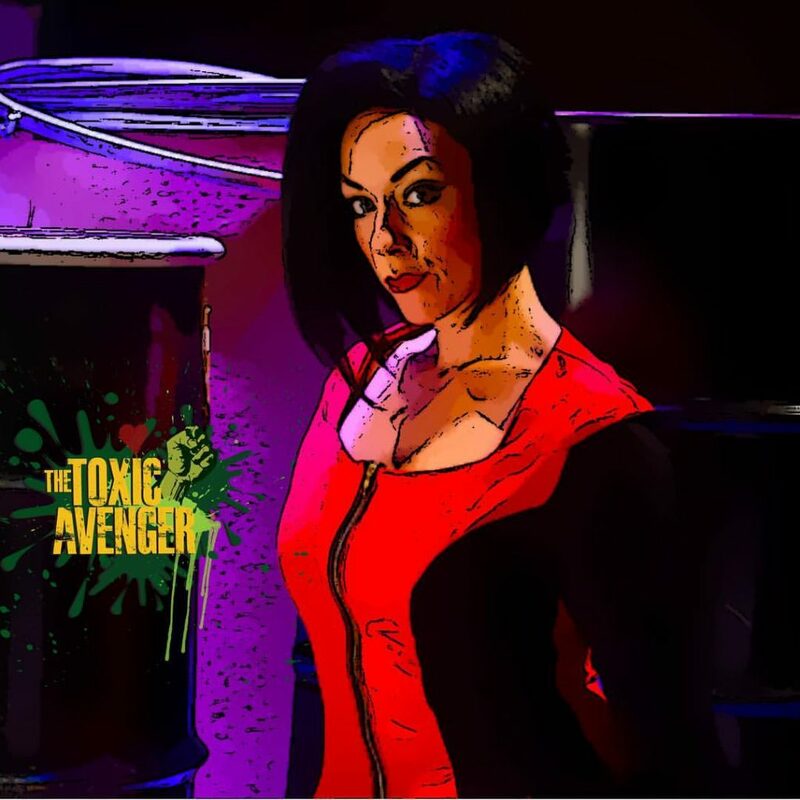 Toxic Avenger is just the hero we need to transport us for a short while, to a place where we are not entirely helpless, and our righteous commitment enables us to find love and perfect solution for the cause of climate change. The Toxic Avenger will be playing at the Stage in San Jose until July 16, 2017 and tickets are available at www.thestage.org . 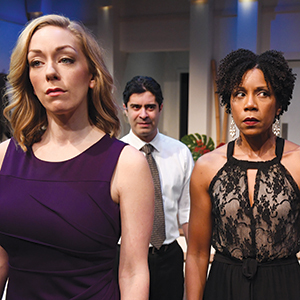 Ayad Akhtar’s Pulitzer prize-winning play “Disgraced” playing at San Jose Stage theater, takes the audience on a deep dive into the complexity of identity formation, change and dynamism of identity, and also identity destruction. The entire drama plays out in a tastefully decorated, beautiful Manhattan apartment, occupied by Pakistan born, Amir Kapoor (Damien Seperi) and his caucasian wife, Emily (Allison F. Rich). Amir is quickly climbing the corporate ladder at his Manhattan law firm and has so wholeheartedly embraced the American dream with its trappings of wealth and success that in order to get a better acceptance, he passes himself off as an immigrant from India, when a partner assumes him to be from India. That is an early peek into the close cousin of identity and the complex arena of stereotypes, where Pakistan generates stereotypes of terrorism and India of engineers and education. If Amir may be embracing fiscally conservative values, his wife Emily is a bleeding heart liberal. While Amir is hiding aspects of his identity and rejects everything Islam, Emily seeks out liberal causes and implores her husband to stand up and fight for what is just and on behalf of those falsely accused of terrorism related activities, in the aftermath of 9/11. Emily and Amir are hosting a dinner party for their elite, high-powered friends, Jory (Kathryn Smith-McGlynn), a lawyer from Amir’s firm and her husband Isaac (Jonathan Rhys Williams), a curator at the Whitney Museum. Just as Amir denounces everything Islam, Emily constantly contradicts his criticism of faith and insists on finding “beauty and wisdom in Islamic tradition”. Her paintings draw on Islamic art and she insists that the Muslims gave the world a “visual perspective”. She has created an Islamic piece of art and is hoping that she will get her big break through Isaac. Isaac is Jewish but critical of Israel’s military actions in the region. His wife Jory is African-American and is fully aware of the impact of racial profiling. As the story advances, through various twists and turns, a complex picture and many questions emerge. Do people feel pressured to renounce their “other” cultural identities in order to gain mainstream acceptance and climb the ladder of success in America? Do people suppress rather than erase, sometimes with bitterness, their primary identity, even as they embrace mainstream values? Amir shares the story of growing up Muslim where his mother not only wanted him to embrace his culture and religion but also taught him prejudice against “others”. Albeit he embraced mainstream values but deep inside he felt rage. The fascinating aspect of this play is that it centers not just around Amir’s story. Jory has her own identity battle, as does Isaac and in fact, Emily has her own identity issues. At an individual level, there are multitude of factors that contribute to a person’s identity, including geographic location where one grows up, one’s religion, one’s peers, parents, teachers, siblings, as well as one’s personality and temperament. However, when others perceive an individual, they tend to simplify and often judge or assume someone’s identity based on one or two factors that matter to the perceiver. At societal level what creates infinitely amazing kaleidoscopic reality is how diverse identities of multitude of people collide and intersect at multiple levels, especially when invited to focus exclusively on identity, as in the current political environment. And finally, constant and extreme pressure to prove oneself, to suppress one’s innate identity and everything it meant in one’s formative years; real or imagined pressure to renounce one’s faith, religion or culture in order to fit in, to prove oneself, takes an incredible toll on a person. The stress can manifest in diverse ways including depression, addictive behaviors, violence, and irreversible adverse impact on health. At least one or two of these are manifested in this story. San Jose Stage Theater (www.thestage.org) has always brought bold and relevant productions and participated in raising important questions and promote crucial dialog in our society and this play is immensely pertinent in the current political, cultural environment. Great kudos to the production team, to Ayad Akhtar, to Director William Ontiveros and the entire creative team. 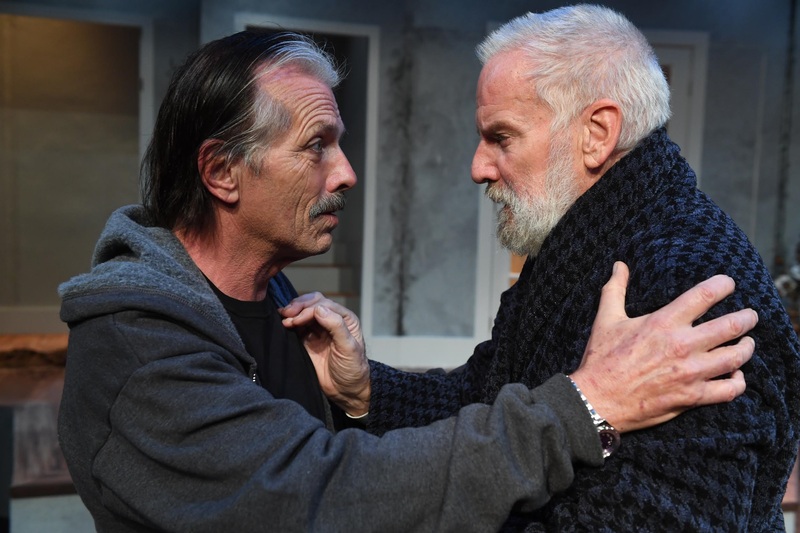 The Night Alive, written by Conor McPherson and directed by Tony Kelly, is a kind of nativity story focusing on compassion and kindness although the beginning seems like it’s anything but that. The play starts by providing a glimpse into the slice of anguished lives of a few lost souls and faint but clear glimmers of hope appear by the end. Tommy (Randall King) rents a room in his uncle Maurice’s (Julian Lopez-Morillas) old Edwardian house in Dublin. Uncle Maurice lives upstairs and though critical of Tommy, he also loves him. Tommy’s friend, Doc (Lawrence Radecker) is Tommy’s little sidekick who also frequently sleeps in the room and helps Tommy with odd jobs. They scrape by from day to day work and live amidst junk-filled squalor of the room. As the play begins, one night Tommy rescues a young prostitute, Aimee (Allison F. Rich) and bring her home to get her cleaned up. Aimee has no place to go and she ends up staying, for that night and another and another. Tommy has been estranged from his wife and kids and does not have anything significant to look forward to in life. But a sort of friendship develops between Tommy and Aimee and it brings a little sunshine into his otherwise dark life. Friendship also sprouts between Aimee and other men. Doc is a little slow and at first he is not quite approving of the loss of his sleeping place and of his friend’s attention. Uncle Maurice is also somewhat disapproving at first. Deadpan humor while all these lost souls are trying to find their bearings in a situation of change and chaos is often heart-breaking but things start to get resolved and just as there is emergence of hope for a kinder gentler life, the story takes a turn. Aimee’s ex-boyfriend Kenneth (Jonathan Rhys Williams) comes looking for her and completely disrupts their lives. Is that not how life often unfolds for people with lower means and resources, and keeps them imprisoned in a vicious circle where while they continue to live, life in a true sense seems to emerge every now and then but continues to stay out of their reach? For this group, as life unfolds in the moment, as they live without dreams, goals and a future, their little attempts at humor seem like attempts to grab fleeting happiness, whenever they can. Doc once brings a book titled “How to survive life-threatening situations”, and reads from it. As the audience laughs at totally non-helpful suggestions outlined in the book, a question lingers, how does one survive life that has nothing to offer? If however, the ending is good, rest does not matter. Play ends ambiguously, albeit at a place where a little hint of hope, a faint flash of faith emerges. Sometimes love and kindness may just be enough to open a future of possibilities. The Night Alive is playing at www.thestage.org in San Jose till December 11, 2016.